Junior School Investiture Ceremony was celebrated at Jodhamal with great patriotic fervor. Additional Deputy Commissioner Jammu Mr. Arun Manhas honoured the occasion as the Chief Guest. 34 Student Leaders were inducted to Junior School Prefect Council Headed by SPLs Yana Rai & Ahmad Ayaan, ASPLs Charanpreet Singh & Gunjot Kour, Sports Prefect Arshlaan & Vadaanya, CCA Incharges Swasti Gupta & Arav Saraf, Eco Leaders Harsimar Singh Tanmay Sahib Gauri Khajuria Anveshana Charak, Discipline Puneesh Manhas & Takshreen Kour,House Captains Nabiha Mufti, Mudakkir Latiffi, Shiven Agarwal, Subah Sharma, Guhika Sachdev, Arav Vivek Gupta, Saannidhay Gupta & Tavleen Kaur, House Vice Prefects Rohan Gupta, Angelina, Aryan Gupta, Rahini Sharma, Dhyrya Aditya Suri, Naureen Liaquat, Jasmandeep Singh , Maanya Mahajan ,Jivi Gupta & Lavaansh Aggarwal..... Senior Head Boy administered the Oath for the newly elected Council....Vice Principal Shefali Sanwal in her speech complimented all the young leaders and told them that with power comes the responsibility and each one needs to keep their school flag held high....Mr. Arun Manhas also complimented all leaders and their parents who were present on the occasion and said in his speech that if one is determined there is nothing which can stop a person from being successful. All the parents and the guest felt highly elated and impressed with the short and crisp Investiture Ceremony held in the school MPH. The celebration started with a patriotic Song sung by middle school students and then a Dance by the Grade 2 & 3 students. Principal Trilok Singh Bist thanked the Chief Guest for sparing his valuable time to be there at Jodhamal with his better half and said that all leaders need to lead by example for that is the only way of making the people understand you and follow you otherwise preaching makes no impact on anyone. Head Boy Nipun Sharma administered the Oath to the office bearers, Head Girl Dhwani Gupta gave the welcome speech and Deputy Head Boy proposed the Vote of thanks whereas the Deputy Head Girl moderated the complete ceremony. Highlight of the day was when the SPLs and ASPLs spoke where each one of them were so crystal clear in their vision for their school at such tender age and the clarity of voice, diction and the choice of words really mesmerised each present in the hall. The programme came to a close by singing Saare Jahan se accha in Sanskrit as 'Vishvesti Sarva Shreshtha Bharat Dharasma diya madiya' in unison and finalkly Muskan Sahil sang the Concluding shloke in her melodious voice followed by the National Anthem. Jodhamal Hosts a Synthetic Phonics Workshop for Junior Teachers. SashwatiSatpatti an Alumni of Singapore University and a Synthetic Phonic Trainer from Bhuvneshwarconducted a two day vibrant workshop for the Pre Primary & Primary Teachers of Jodhamal Public School to ensure the 21st century education to the students who are entrusted to the school. The workshop started with the sounds and how to make the sound like a synthesizer and make it a synthetic sound. Stapatti discussed the 42 sounds from 26 letters of English and told the teachers to never ever make the phonic sounds using Hindi or any other vernacular rather the 42 synthetic sounds to make the students join the letters to make reading easy for them by the blended learning. To an answer to the question What is Synthetic Phonics?SashwatiSatpatti explained thatPhonics is nothing but relating sounds (phonemes) to letters (graphemes) or group of letters. It is an instructional method of teaching children to read. They learn how to blend letter sounds together to make words like 'Dog'. It's not easy as it sounds because 26 letters in the English alphabet correspond to 42 sounds. Phonics not only helps the child to read but also spell with ease. It helps them decode words by using the knowledge of sounds. It is vital as it does not depend on the photographic memory of children and aids them in reading new and unfamiliar words, thus enriching & enhancing their vocabulary. Synthetic Phonics Benefits to Childrenaccording to Saswati : Start Enjoying Reading;Builds Sub-Conscious Mind; Improves Speaking Skills; leads to Smarter and Self-Confidentchild.When should a child be introduced to Synthetic Phonics? The best time to introduce phonics to a child in between 4 to 6 years. However children above 6 years & up to 9 years have not developed good English reading, speaking & spelling skills, phonics will definitely help.Why should you try learning to read early on? Research has shown kids who are able to communicate well in English in early days of their growing perform well in their academics & actually enjoy success in school. They are free of any stress at the subconscious level & apart from excelling in studies, also have very high self esteem&self confidence. Voracious acquisition of new knowledge through reading helps children build a strong academic foundation.CoordinatorsRanju Malhotra, UrmilaKaul&NeetuJohri appreciated the workshop and said that such workshops add on to the capability of the staff and from Pre Nursery itself we need to incorporate it. 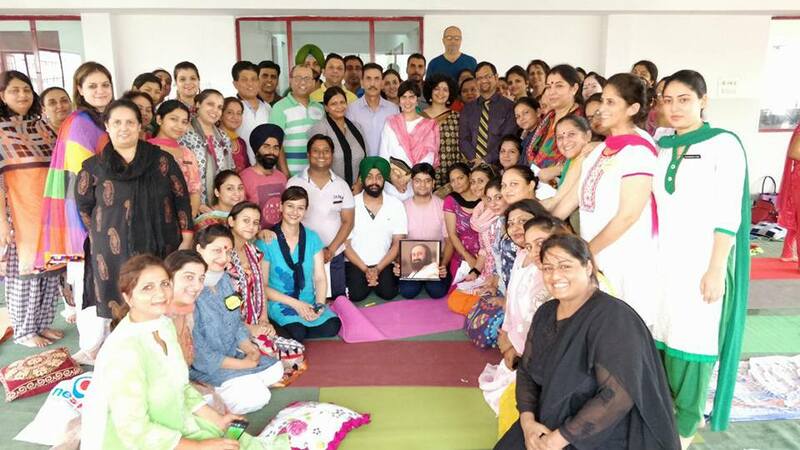 Trilok Singh Bist the Principal of the school appreciated the concept and was happy to see the sea change in all the 50 teachers who were a part of this fruitful workshop. Trustee NandanKuthiala& Vice Principal PoojaPanthri presented a token of appreciation to Saswati Nanda Satpatti for making these two days so enriching for the faculty members of Jodhamal. Art of Living Happiness Course was done by 65 teachers of the senior school of Jodhamaland each one felt being transcended... Happiness Course was conducted by Art of Living instructor Ms. ShwetaGolani who came from Bangalore from Shri Shri''s Ashram and is the renowned AOL teacher from Dehradun...without dipping in water we can never truly know how it feels to have a swim? 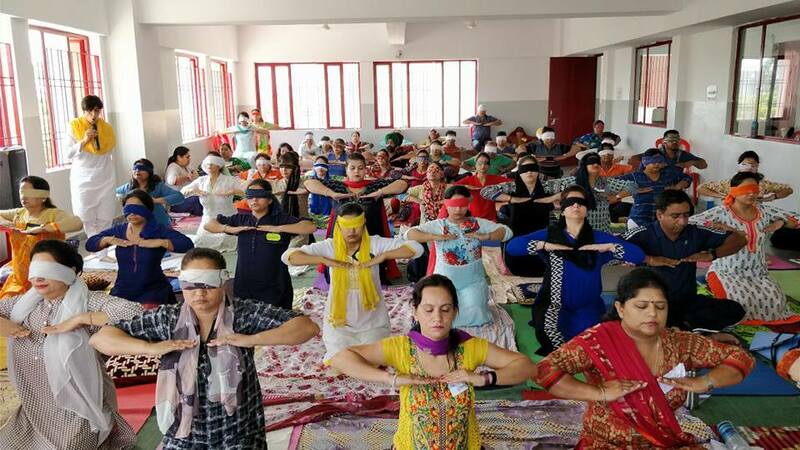 This Happiness Course by Shwetaji made Jodhamal teachers effortlessly sponge up whatever was offered in the Programme in the three days course.. Most happiest three days for each staff member and they all experienced the transition through the techniques taught, processes done and other practical tools taught during the course....Each one went home after completion of the course as a calm, relaxed, healthier, more knowledgeable and happier person with easy to use tools they can use to maintain the benefits of this course for a life time...A happy mind makes us stay calm; make better decisions and improve the overall quality of life and with such feelings the course came to a close.. All teachers appreciated Ms. ShwetaGolani's energy level and knowledge and were highly elated to have been provided this opportunity by the school management....School Principal Trilok Singh Bist appreciated the efforts of the forward looking management which does things out of the box and sets precedence..NandanKuthiala and AratiKuthiala are dedicated to the cause of education in the state and are determined to take the school education to the next level in the state. During the course the Techniques taught to accept the people and situations the way they come, was one of the lesson for all those who get disturb at the slightest of the blow in life. Shweta Golani told everyone that the opposite values are complimentary to each other so if we have some sorrow in life then only we will be able to value the happiness and if one experiences the heat then only he would sense the cold. She also told the teachers to have their opinion and should not become the football of other people’s opinion. During the SudershanKriya the teachers felt so relaxed and got transcended to a different world. Art of Living was an experience of an altogether different kind which most of the schools and corporate world is giving to their employees and IIT’s are providing to their students and Jodhamal Public School has taken the first step forward and is determined to get it for staff, students, support staff and even for parents in the times to come. Jodhamal School Conducts Career Counseling Session for Parents. Jodhamal Public School conducted the Career Counseling Session for the students of Grade X and their Parents in the school OAT where the parents and students were counselled on how and what subjects to take to make their passion come on the surface. The Session started with the formal welcome by the Principal Trilok Singh Bist and the Lighting of the Lamp by Mr. & Mrs. Sanjay Sharma the parents of Khushi Sharma who were the early birds to this session along with the Vice Principal Monika Sethi and Adm Officer Bharat Bhushan Sharma. Resource person to this session was the school Principal Himself and started his session with a Video where he focussed on the Hard Work and Success. Bist said that people say that Hard work is the key to success but in this 21st Century Hard Work in the right direction is actually the key to success and not just the hard work. Some times a child is putting in a lot of efforts and still the results are not the expected ones and on the research it says the choice of subjects after class X make a lot of impact on a child's personality. Right choice of subjects after the realistic options in mind if we select the subjects then there is no reason for a child to be not to be successful. All the parents were asked to take some time and have a man to man talk with their children to help them in deciding the choice of subjects for the betterment of their children. All parents were told of more than 250 conventional and non conventional courses in which their kids can go in for and were asked to encourage their kids for living their passions since at the end of a day if a parent has to make a choice between a successful child or a happy child will always prefer their children's happiness over anything. Whether science or commerce or humanities depends on the right choice of subjects at Grade XI and tapping the potential of a child and honing them in that direction only will bring the best out of a child and Bist insisted on getting the parents brainstorm and ask a lot of counselors online or otherwise to find out the hidden talent of their child to support him or her and make them put in a lot of hard work in the right direction to make a difference. All the parents were very happy to be a part of this Counseling Session and students were also told that there is a unique key for all locks and only one key can open that lock similarly each child is unique and each child has some talents and potential and putting the right key to unlock the right career for a child will make the the child flourish in the chosen field. Students and parents who were the part of this session appreciated the complete program and felt that they got a lot of insight into the career options and even the students of grade X were happy to know about almost 250 career options for them since they felt only Engineering and Medical and CA were the only the choices for the students but in the Session they came to know of all unconventional career options like Fashion Designing, Jewellery Designing, Auctuaral Sciences, Medical Transcription, Army, Navy , Air force and Merchant Navy, Company Secretary, Advertisements, Event Management , IAS, KAS, IES, and so on and so forth. The Session came to a close with the introduction of all the PGTs of Jodhamal and a video on how and why should an Educational System have the same yardstick to measure everybody's capability and why should a fish be made to climb trees to get educated. On this note the Counseling Session came to a close with vote of thanks by the Vice Principal Monika Sethi.